Over 120 journalists, representatives of journalists’ organisations, national media regulators and press councils, as well as academics, politicians, and civil society activists gathered on 15-16 February at the Solidarność Centre in Gdansk, Poland, for a conference on “Free European Media”. The event has concluded with a number of proposed steps, including the need to strengthen partnerships between all stakeholders. The event has been organised by the European Federation of Journalists (EFJ) in cooperation with the Council of Europe (CoE), the Nordic Journalism Centre, the European Centre for Press and Media Freedom (ECPMF) and the International Press Institute (IPI), with the support of City of Gdansk, Pomorskie Region, European Solidarity Centre (ESC) and European Federation of Public Service Unions (EPSU). 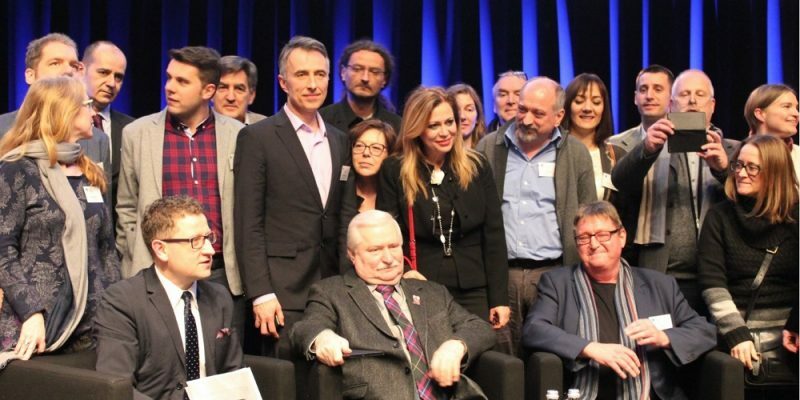 Participants, including Nobel Peace Prize winner Lech Walesa and investigative journalist from the International Consortium of Investigative Journalists (ICIJ) Matthew Caruana Galizia, who won the Pulitzer Prize together with colleagues who worked on the Panama Papers scandal, commented the worrying state of press freedom from several angles: keeping new media and independent journalism free from state control; pluralism as a factor to encourage and sustain democracy; how legislation violates media freedom; and the role of ethical standards and self-censorship. Harlem Désir, the OSCE Representative on Freedom of the Media, and Patrick Penninckx, Head of the Information Society Department of the Council of Europe, addressed messages of support for freedom of expression, expressing growing concerns on the current state of press freedom in Europe. Both called on member states to respect their own commitments to protect journalism and journalists. “Today, media freedom and pluralism is clearly at risk, not only in neighbouring countries or in remote places, but also in the European Union”, said Manuel Mateo Goyet, from the cabinet of EU Commissioner in charge of media, Mariya Gabriel. In his welcoming speech, Mogens Blicher Bjerregård, president of the European Federation of Journalists (EFJ), sent a firm message to all European leaders: “Stop all attacks on journalists and media. Let free, independent and pluralistic media thrive. Therefore, we expect from our political leaders, full support for Press Freedom. Full stop”. Around 55 trade unionists from 41 EFJ member unions in 30 countries (*) were in Gdansk to show solidarity with Polish journalists. The members of the Steering Committee of the EFJ visited on Thursday morning the local newsroom of daily “Gazeta Wyborcza”, where they organised a meeting with the EFJ Polish affiliates. Over 20 organisations took part in “Free European Media” conference: Albany Associates, ARD, Article 19, Association of European Journalists (AEJ), Committee to Protect Journalists (CPJ), Ethical Journalism Network (EJN), European Broadcasting Union (EBU), European Commission, European University Institute (CMPF), European Solidarity Center, IFEX, Index on Censorship, International Media Support (IMS), International Association of Press clubs (IAPC), International Consortium of Investigative Journalists (ICIJ), Mass Media Defence Centre, Media Ethics Council Macedonia, News Media Europe (NME), Organization for Security and Co-operation in Europe (OSCE), Public Media Alliance (PMA), Université Libre de Bruxelles, University of Gdańsk, University of Malta. In connection with “Free European Media” conference, the EFJ has launched a debate book with chapters on different topics until now from eight European countries (Poland, Turkey, United Kingdom, Serbia, Russia, Denmark, Greece, Czech Republic). You can read them online. Printed version will soon be available. (*) Albania (APJA), Azerbaijan (JUHI), Belarus (BAJ), Belgium (AGJPB), Bosnia and Herzegovina (BHN), Croatia (CJA, SNH), Denmark (DJ), Estonia (EAL), Finland (UJF), Georgia (IAGJ), Germany (DJV, dju in ver.di), Greece (Esiemth, Espit, JUADN), Iceland (UIJ), Italy (FNSI), Kosovo (AGK), Lithuania (LZS), Luxembourg (ALJP), Macedonia (ZNM), Montenegro (TUMM), Norway (NJ), Poland (SDP, SDRP, TD), Portugal (SinJor), Russia (RUJ), Serbia (UNS, NUNS, Sinos), Spain (FAPE, FeSP, CCOO), Sweden (SJF), The Netherlands (NVJ), Turkey (TGS), Ukraine (NUJU, IMTUU), United Kingdom (NUJ). Many thanks to the organisers of the #FreeEuropeanMedia conference! Obviously I missed a great meeting in Gdansk. But the results and recommendations should be presented in the European Parliament.